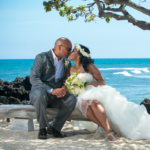 This couple got married at the Four Seasons Resort on the Big Island of Hawaii. 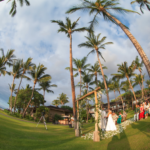 They had an intimate beach wedding around an hour before sunset. The bride started with pre-ceremony photos in the room and then a few on the way down to the ceremony. Her bouquet was a mixture of tropical flowers which looked beautiful against the tropical wedding background. 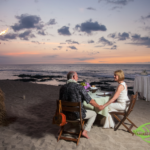 The evening ended with sunset photos and then a romantic dinner for two on the beach.